When I was a child in France the word “culte” just meant “worship.” Still does. Of course, in the USA a cult can be anything from “the cult of skinny jeans” to some dark, authoritarian thing. But the term is becoming a problem. Religions trying to fight what they call “cults,” often find themselves with the same label. That’s because many people opposed to “cults” are really opposed to religion in any form. That’s not new news. State-sponsored German attacks on Scientology in the eighties destroyed careers and denied access to school for innocent children. You may not agree with a particular religion, but without religious tolerance, we all die. Everyone is hated somewhere. Every faith group is in the minority someplace in the world. Muslims are attacked in this country. Catholics are persecuted in Nigeria. ISIS carried out a bloody campaign against Iraqi Christian sects. The list goes on. 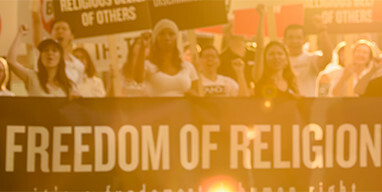 I hear that, at the International Religious Freedom Round Table, (a large multifaith collaboration based in Washington D.C.) it’s common to see a Baptist make common cause with a Scientologist. That’s because they know that, when A&E insists on keeping a hate show going despite plummeting ratings, they’re not attacking one faith. These people are building a business based on attacking religion. Period. Look: you may think a faith is odd or strange, or even darkly persuasive. But so what? The far greater danger comes from the forces opposed to religion. Any religion. The saying “the enemy of my enemy is my friend” isn’t very useful when the enemy of your enemy is also after you. People of faith who rely on anti-religionists are asking to be next on the list. In the breathtaking sci-fi series The Expanse, the people living in our solar system are endlessly fighting each other, even while a terrible threat is coming from far outside the system. Kind of sounds like the religions of Earth today. An existential threat faces religion. You may not agree with a particular religion, but without religious tolerance, we all die. And even “tolerance” isn’t enough. If you look it up, you’ll see that it’s really a kind of passive-aggressive word for turning one’s head and “letting” someone else exist. Just stay in your corner. That kind of “see no evil, hear no evil” won’t protect us all from bigotry. We need a new term: respect. When I respect you, I honor you. I want to listen. I consider you important. And I want to support you in your good works. Respect, not tolerance. If we practice respect, then we can support belief—whatever shape, size or color it comes in. #respectfaith. Because the alternative is no faith at all—and a world without faith is a dangerous one indeed.